Navigate the General Science 1 course with your student with the help of the Teacher_Guide. Survey these science subjects—ocean, astronomy, weather, and minerals. 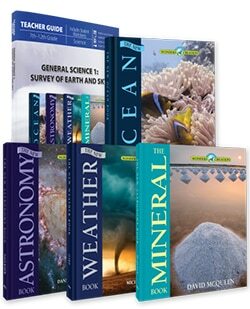 Learn about earth science with these Wonders of Creation books: The New Ocean Book, The New Astronomy Book, The New Weather Book, and The Mineral Book as the texts. Complete a one-year earth science course for seventh to twelfth grades. Study one earth science topic each quarter in the General Science 1 Survey Course. The General Science 1 Curriculum Package includes one of each of the following books. As the fourth entry in the “Wonders of Creation” science curriculum, The Ocean Book answers questions and more, with full-color photos, charts, graphs, and illustrations that bring the murky, mysterious depths of the ocean to life. It contains many scripture references where God speaks about the oceans in His Word. The Ocean Book can be used as an oceanography reference book. All ages from a middle school level and up will enjoy this informative and fascinating book. Preview a sample at the publisher’s website. Wonders of Creation: The Mineral Book was developed for multi-level teaching with three skill levels. With a biblical view, your homeschool student will learn about mineralogy. Discover the properties of minerals, where they can be found, and how they are used. Includes a full-color pull-out poster. Full-color illustrations and pictures with 96 pages. Grades 5-11 with a multi-age design for different grades. The Weather Book (Wonders of Creation science curriculum) studies meteorology. It starts with the “big picture,” our place in space, and explains how each of the various weather conditions play a role in our daily lives. Learn how thunderstorms build, hurricanes are formed, tornadoes destroy, and about crazy weather phenomenon. Included are fascinating insights to weather in the past, including Noah’s flood and the Ice Age, and weather in the future. Safety tips are given for dangerous weather situations and instructions for building a weather station. Fifty full-color illustrations and over 75 photographs help make this book equal in quality to any public school textbook. The Weather Book is the first in a series that honors God as Creator. Complete with all you need to quickly and easily begin your home education meteorology and astronomy! One year science program. Based on the number of hours of course work, you can give from 1/2 to 1 credit for high school. More information on this is available in the Teacher Guide.